Refrigerator Display Panel Is Blank Not Working – How To Reset? Recently we had a power outage and the display on our refrigerator went blank. The refrigerator is working but the screen/display panel is not. Our power went out for a few hours and now we can’t get the display panel working again. The fridge is cooling and so is the freezer. The only issue is that the display is not working and not showing the numbers. I have heard you can press a button on the display and it will reset it. What do I press to get the numbers to come back? I have a Samsung refrigerator. We will show you which buttons to press to reset the display control panel on your refrigerator. Many of the examples below apply to Samsung refrigerators but also can apply to GE, LG, and many other refrigerator makes and models. If your fridge flashes E and 5 after a power outage, or is blinking a blue letter, you can use the methods below to reset your refrigerator. 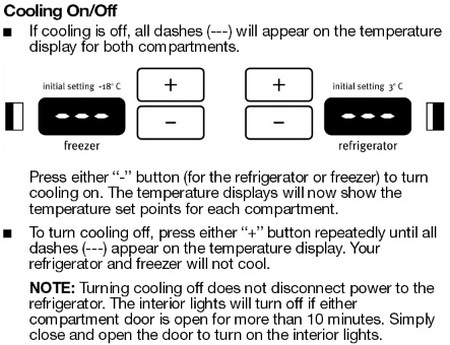 Refrigerator Display Reset Method 1 – Hold down the “Energy Saving” and “Lighting” buttons at the same time for 10 seconds (or top left & right buttons). Your display panel should immediately return to normal. Refrigerator Display Reset Method 2 – Press “Power Freeze” & “Power Cool” at the same time for 10 seconds and the display should reset and come back on. Refrigerator Display Reset Method 3 – Hold the top left and top right soft touch buttons on the screen “power save” and “lighting” button and hold both buttons for about 8 seconds and it will reset. Refrigerator Display Reset Method 4 – Press the “Freezer” and “Ref” buttons at the same time for 8 seconds and the reset should work. Refrigerator Display Reset Method 5 – Press and hold the “power freeze” and “vacation” buttons for 8 to 10 seconds and the display will reset. Refrigerator Display Reset Method 6 – Press and hold the “energy save” and “lighting” button for 10 seconds and the display will reset. Refrigerator Display Reset Method 7 – Press and hold the “ice type” and “filter reset” button for 10 seconds and the display will come back on. Refrigerator Display Reset Method 8 – Press and hold down “quick freeze” and “vacation” for 8 seconds and the display will reset. 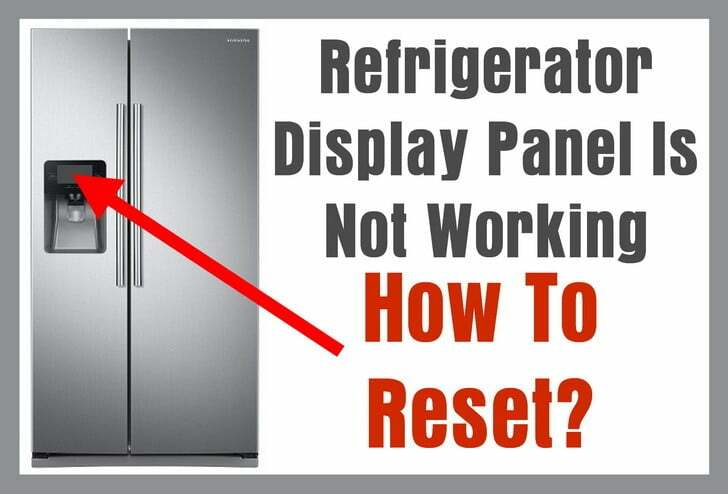 These refrigerator display reset methods should reset the display panel on your refrigerator. If it does not, you may have a bad display board, bad main control board, or have a wiring harness issue. There are many types and models of refrigerators. The general way to troubleshoot a refrigerator that has a blank display panel, is to first try the reset methods above. If nothing resets the display, you will need to troubleshoot to find out what is causing the display to be blank. First try to see if the display panel may have a bad or loose connection with the wire harness. If you find it is connected properly and secure, you may have a bad display board. If you can determine that the display panel and display board are working properly, you need to trace the wire harnesses to find where the issue is coming from. If the wire harnesses are not damaged and secure, you may have a bad main control board. The main control board is located behind the refrigerator under a small rectangle shaped panel. Test all components and find which part is causing your no display issue. 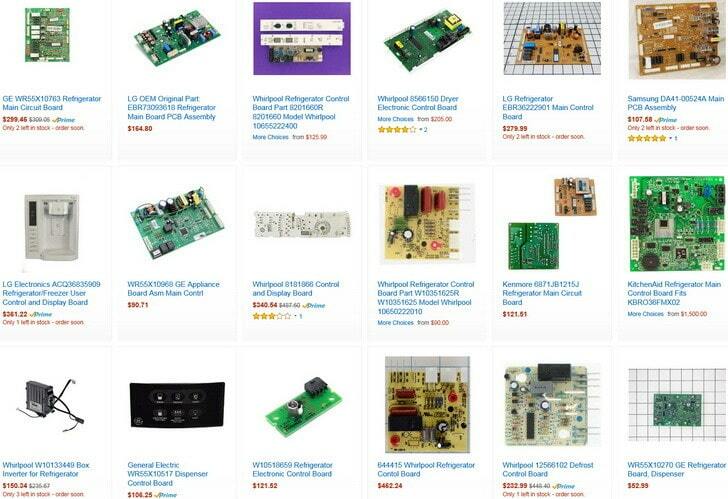 Below are some parts for all refrigerators including the display panel, display board, wire harnesses, and main control boards for all refrigerators. If your refrigerator is NOT COOLING, check the page here for how to troubleshoot a refrigerator not cooling. If you have an issue you cannot fix yourself on your refrigerator, please leave your question below and we will be happy to assist you with your refrigerator display problem. Please supply us with the make and model number of your refrigerator when asking a technical question. Maytag model#MF12269VEM7. Had a power outage and front panel light up when pressing any key at the beginning and stop lighting up few min after. I hear motor trying to start and beeping for few second. Sometime it run for 2 second and shuts off again. Is there something I can do to fix that? 5y and CE in degree area. Lights out in fridge not sure if running. My Samsung (RF28K9070SR/AA) is working, control panel works but on normal operation the temp status display no longer stays on. Stopped after a storm/loss of power. Is there a procedure to keep temperature indicators illuminated? My whirlpool freezer door display is not working properly. It will only show us the lock icon. We have tried holding the lock button to unlock it and it will not do anything. Is there a way to reset or what do i need to try? I have a whirlpool gold that doesnt run. at all, and the dispenser screen is blank. Till you hit any button and all lights come on including three zeros for refrigerator and freezer –having replaced the circuit board behind this display it does nothing –just the same situation given the fact that it lights up all buttons s, till you release -it’s hard to believe it’s the main board it’s also hard to believe it’s the touch panel cuz everytime you hit any button it does respond the same way..model gifsaxvy01 whirlp. Frigidaire Gallery FGHB2844LEG was giving a SY EF error. Changed out the Evaporative Fan Motor and Fan still wouldn’t work. Changed the Main Control Board in the bottom. Now my display on the door after plugging it back up only shows the factory temp for a few seconds then goes blank. All the soft buttons works except the temp. Can you help with this. I have unplugged it and left unplugged for 10 minutes and still the same factory temp then goes blank. Turned the unit off on control panel and left off for 10 minutes and still nothing. Could my new control board in the bottom of the unit be bad? Part #24211539 Board Main Power. My GE fridge model GSH25JSTC SS display panel won’t turn on after a power outage. This happened a couple of months ago and I randomly pushed some buttons and the display turned back on. I cannot remember which buttons I pushed. Can you help me? Lights in fridge are on. Display panel off. Fridge not cooling. The touch pad may be unplugged or burnt out if there is nothing on the screen. You can attempt to unplug the fridge and dissasemble the front panel and check to see if the wire harness has become disconnected on the touch pad panel. If the panel died and the freezer stopped cooling, is it possible the control panel was changed and put into a different mode? I have a Haier HBM450HSA1 Fridge-Freezer. The LCD display panel is not working but the fridge and freezer appear to be working fine. Control panel not working. Reset methods do not work. Ice being made but not dispensing. Fridge and freezer are working. I’m out of ideas. We just purchased a Samsung flex zone 4 door refrigerator (rf28k9070sg/aa). We have it hooked up and it is running ok, everything cold as it should be. The only problem is the display panel is saying our freezer is 80 degrees and the fridge is 79. I tried to do a reset on it which turned the panel off then back on. Upon turning on, the temps still show the same. Any suggestions? I have a Maytag model MFI2568AEW. The Fridge and freezer is working but the interior light and the control panel is blank. I tried every code I can find. I unplugged it and I reset the breaker, nothing works. The only lights I can get to come in is if i push and hold the door alarm button the light will come on and say “F_C”. And the other screen has the degree circle and can switch from C to F also but I can’t choose either of them. PLZ HELP. After a lightning storm and power outage, my KitchenAid refrigerator (ksso42ftx04) display panel was not working and the fridge was making a slight clicking noise. I shut it off and turned it back on but the fridge would not come back on. What part(s) do I need? I have a Jenn-air JFC2089WEM side-by-side refrigerator. I just changed the water filter and am now having a problem getting my refrig temp back to 38. It is at 44. How do I reset? I just bought a new house, the previous owner left a Frigidaire Gallery refrigerator ( Model NO. FGHC2331PF6) . At the closing day I asked the agent to turn off the refrigerator because we were going to clean it later, but now I can’t turn it on. the panel is totally black and not responsive to any push. Please help. We have a Maytag model mfi2569veq1. The display is not working. Fridge and freezer both appear to be not working. Unable to get water or ice? Control board is dark until you hit any button. When button is pushed all characters and leds light up. We have a Maytag model mfi2569veq1. The display is not working. Fridge and freezer both appear to be working. Unable to get water or ice? We just replaced the board that controls the Freezer defrost- once all was replaced and plugged back up the display is not working Kenmore 10672009010 French door. My problem is with a GE GSS 22SG which was given to me (so I have no manual) and hasn’t been used for two years. I plugged it in yesterday and it began to get cold (freezer anyway) immediately. The only light on the panel was for the water filter (which I had replaced earlier in the day). Press and held, nothing. Light stays on. I ran a couple of quarts or so of water thru the dispenser. A couple of hours later I noticed the light was off. But the fridge wasn’t cooling either. And water isn’t dispensing. Lights on inside. I unplugged the unit. This morning I went nosing around the back after reading online. Removed the panel over the control board and a cup of water drained out! (Literally a cup, I captured it. So, how could the unit have cooled at all or any lights work, if the control Board was covered about 3/4 the way up with water? Before I found the control board, I was assuming the evaporate fan motor was out since the fridge side wasn’t working. Is it possible the control board can be saved? Any ideas? Oh and the ice maker green light glows, I can’t depress the off button on the ice maker (on the maker itself). That appears to be the only sound coming from the machine when I plug it in. We are snowbirds and just returned. I plugged the fridge and it doesn’t start to run. Open the doors lights on. Front panel if you press any button “000” come across the screen and when released they go blank. Never had an issue before and have been doing this for 14 years. I’ve had the fridge for 3 years. No clue how to turn cooling on. The control panel to my whirlpool refrigerator is not working after an outage. I unplugged it for 5 min then plugged it back in and still not working. After a power outage, my Whirlpool Gold standard MODEL: GI5FSAXVY01 refrigerator has stopped working. The fridge is not cooling and I do not hear any noises however, the lights are on and when I press a button on the control panel all lights illuminate. When I press the ice or water button an alarm goes off continuously until I remove my hand. I have tried unplugging the fridge and tripping the breaker. How do I reset a Refrigerator Hitachi? I currently have a Samsung American fridge freezer Model number is RSA1WTMH and I have activated the child lock. However I now need to deactivate it and it is not responding. I’ve turned the power supply off and even tried to do the display reset but these are not working. I have a GE refrigerator mn#cfe29tsdbss 2013. After I plugged the unit in after replacing a evap fan motor, the display on the ice control panel keeps turning on, displaying “GE” and shutting off, restarting display and looping over and over. I tried a reset by unplugging the fridge between 30 and 45 seconds, then re applying power with no luck. I am not sure if the main controller or the display board is bad at the ice maker door. The refrigerator is cooling, and freezer is fine. The ice and water does not work and no ability to control temperature up and down, cant access menu as the display resets over and over. I have a Samsung RS263TDRS and the lighting is only working on the top portion of the panel. The lights for ice, water and filter do not light up, although they do dispense. We had a power outage recently. After power came back, our Maytag refrigerator control panel on the door went dark. Even though the interior lights were working, but the compressor and circulating fan motors were not working. Ice dispenser was not working either. I had tried to unplugged the power core for several min. and plugged back in. I checked the internet and follow some suggestions to do manual reset. That was not working. However, I did notice that about 5 min after the power core was plugged back in, the fridge control panel display came back. But it came back for only a few seconds. Then the control panel went dark again. At that point I gave up and started to move all the food out of the fridge. The fridge was still plugged in. About 12 hours after the power outage incident, the fridge started working again. All the display came back, ice dispenser was working, and all the motors were running. The fridge apparently wakes up after 12 hours in coma caused by the power outage. I would like to hear if someone can tell me how the Maytag self reset logic works. I recently had a power outage and the numbers on my refrigerator are not working. The freezer light and fridge light will come on and the power panel is blank. The compressor and fan are not running. I’ve unplugged it and plugged it back in and it’s not working. Please supply model number of refrigerator. I have a Kenmore 596 believe to be made also by Maytag. Question 1: Did Dan ever report back if he got his unit working and what he did to do so? Question 2: Which control board did he replace? a) in one in the back of frig or the one in the door for temp and function control? Question 3: Why would “faulty relay or cap in the back bottom” prevent the the front control and display from not working properly or at least stay illuminated without holding any button down? Question 4: It seems like the display/function processor may be stuck in a power up mode and when a button is depressed it acts like a “test all display lights” like when you start your car the display lights up when you first start your car to test console display. If this is what it’s doing do you know how to get out of this precheck mode or do you know where I can link to a schematic to test different signals from ECU? Also like to commend you and your team on a well informed tech support blog keep up the great work and I take my hat off to you all! Refrigerator Series Parts Model GSL25JFXNLB The control panel is not working and we cannot control the cooling therefore the refrigerator is not cooling and nothing works but the lights. The refrigerator has been sitting without being used for about 2 years. Our refrigerator just went out. It is a GE profile model PFSS6PKXCSS serial RS901523. It was working fine and suddenly stopped working completely. Can someone help me to figure it out? My refrigerator control panel is flashing constantly and going off on it’s own. None of the buttons are working when pressed. It has only been since we knocked electric off for the day to have some sockets changed not the ones that the fridge freezer is plugged into. I’m worried the temperature changing is affecting the food it’s an LG refrigerator American not sure of model number. My Maytag control board isn’t working the fridge door was left open for a few hours and now it isn’t lighting up. If I push the access to get ice or water the alarm just rings off but nothing comes out and it lights up. I pulled out the plug for ten/15 minutes but it still isn’t lighting up. How do i reset my display board on my Frigidaire gallery model number fghb2866pf3? The freezer is working but the upper part seems not to work? I have unplugged the wiring harnesses from the main control board After I unplugged the power cord. This I did and waited 15 min then plugged the harnesses back in. I checked the control board for “burnt” spots while harnesses were off. No bad spots – Be sure to make notes of how many wires are in each harness and their positions on the board ON PAPER BEFORE YOU UNPLUG THEM one by one. The fridge “Reset” and my problem was solved. I did this to resolve a freezer not defrosting problem, it appears the control board had a “Timer” in it that “Reset” by unplugging the wiring harnesses. My temp control display was malfunctioning after I replaced a burnt control board on my GE Profile side by side. 24 hours later the display started reading correctly on its own. I have a Samsung French door refrigerator with Flex Zone drawer. The light display is “stuck”. The lighting, cubed ice and filter displays are on but stuck. No other lights will come on. Filter is beeping and driving me crazy! Refrigerator is “built-in” and I cannot move it! My GE Profile Refrigerator #PSS26SGRASS has a malfunctioning temp control display. Main control panel has been replaced and now the display for “fresh” side reads strange symbol. When I first plugged it in after replacing the control board both freezer and fresh temp displays read “off”. Unplugged the fridge to reset control board and no change. Both sides are cooling just LED display not showing status as it did before replacing the control board. I own a GE Profile, model# PFSS6PKXESS. The control panel for going on the past month has had a mind of its own. An audible alarm rising jingle, then descending jingle goes off on the control panel. When this happens, the LOCK goes on and off along with the ICE function on and off sometimes for a few seconds by itself. Temperatures are not displayed and the water filter sometimes makes a sound when trying to reset the filter (Which is odd, because since my water is already filtered before the fridge, I am using the GE Plug that came with the unit instead of a filter) Recently, the control panel was completely unresponsive to touching anything other than LOCK. Once I heard the jingle go off again, I then attempted to use the control panel and only then did it allow me to switch Iced cubed, Ice crushed or water. Does the control panel need replaced? Worked for my Samsung srs702gdhss after a power outage, Power Freeze and Lighting buttons. Thanks. My GE Monogram Refrigerator EIS 360 display panel shows 5555 for both the fridge and freezer after power outage, but cooling for both sides are working. How can I reset the display panel to show the temperatures correctly? I have a Samsung Fridge Model No RT77KBSM1/XFA. Problem is PC display on door is not working properly. Its stays off and intermittently turns on/off with a beep. Please if anyone can advise if PC control can be reset? We have a whirlpool gold series refrig with freezer in bottom. Power outage today and control panel is blank. It will light up with pressing any button but will not reset. Refrig and freezer still works but cannot use water and ice dispensers. Tried all combos listed previously. Any other suggestions? Please help!!! Front panel on the fridge only lights up when open and then when shut goes off after about 20 seconds? Since I had multiple issues with my Whirlpool gold GC5SHEXNS00, (e.g. condenser fan, evap. fan and damper all acting strange or not working) I just replaced ALL four relays and the C32 capacitor on the control board. All those components are now working correctly, the freezer is cold and the refrigerator is catching up. HOWEVER now I don’t have power to the water dispenser and freezer lights (I am guessing ice maker too). Since there is no schematic I was wondering if you (or anyone else here) knows which wire bundle and which relay on the control board powers these items. Thanks much. I have exactly the same problem. By turning the power on-off I can get the fridge lights to come on intermittently and the fridge seems to work fine. I checked the BiMetal thermostat in the freezer section and it was open…..so I replaced it yesterday but the lights going out problem returned….. I am going to put the fridge up on a table so it is easier to work on and try to find the culprit. I am an Electronics Journeyman and have been repairing stuff for almost 37 years now so hopefully I can figure out what it is. About to retire from my current job and want to work on the side fixing fridges in my spare time…..which I should have lots of! I have my Fridge working almost perfectly. Had to move 1 wire on the Board. GE refrigerator model PDS22MIWAWW control panel lights not on after a power outage, fridge working freezer working. Press the 2 top left and right buttons on the display for 10 seconds to try a reset. Are the lights on in the fridge and freezer? Ice maker is working. Thank you for the information, will call for repair technician. GE Fridge model GFSS6KKX sounded like a lawn mower. Noise stops when door is open. Noise coming from Fridge (upper) not from below ( condenser) . I suspect problem with evaporator fan. There was a puddle under the draws which hasn’t re-occurred in the past 10 days. Bought new Fridge but noise stopped before delivery. Fridge unplugged when moved to garage. Diagnostic codes displayed was segment 3 flashing. What does that mean for this model? Holding two top buttons did reset display and I was able to lock the ice maker since there is no water line available. Fridge seems to be working but does not display temperature nor can I change the settings. The fridge is 8 years old. We have a Whirlpool Gold refrigerator with bottom freezer. The temp control panel keeps going up to 7 and it will not go back down causing fresh vegetables to freeze in fridge. Possibly the icemaker is turned on but not making any ice. This can cause the icemaker area to attempt to constantly maintain around a 15 degree temp. Over time this may cause the refrigerator section to get extra cold and begin freezing things in the fridge section. If this is what is happening with your refrigerator then turning the icemaker off may resolve the issue temporarily. NOTE: If the icemaker is making ice, then this may indicate a problem with the fridge sensor, air diffuser, or the main control board. This can be a complex thing to troubleshoot. You may want to have a technician troubleshoot the system. I have a Kitchenaid Refrigerator model ksck25fvmsoo. It is working perfectly but the display panel went blank a few days ago. Can you advise me which possible buttons I must press to get the display back? First unplug the fridge for about 10 minutes to attempt a reset. If that does not work, then the display panel may have gone out or a wire harness is not securely connected. When you press a button (even though it is blank) do you hear a beep? My display panel has the following buttons to press. Just tried to unplug the ref and left it 30 min. Plugged back in all OK but no display panel nor any beeps when I press any of the buttons. Is there a combination of buttons to be pushed for this model? Can you advise me the procedure to remove the display panel for replacement or to check the connections. I couldn’t find any screws nor plastic snaps. I tried this but no luck. Can you advise me how to remove the display in case I have to replace it or check for a loose connector plug? We have a GE fridge and we are having trouble with the display board. Some of the lights light up, but the buttons don’t respond. The temperature of the fridge and freezer don’t display. It also makes random beeping noises almost nonstop. Does it seem like the display board/trim needs to be replaced? What is the model number of your GE fridge? If the display panel is going haywire and beeping for no reason and the buttons do not respond, then yes you may need to replace the control board or display board. Do some troubleshooting inside and check that all wires are connected securely and check that the boards have no obvious signs of damage. If you need further assistance give us the model number and we can go from there. I am having the identical problems with my GE Profile Model PFSS6PKXSS refrigerator as you described in your msg last November. Did you ever get a response from anyone that gave you some advice as to what to do, is yours fixed? Did the control/display board have to be replaced? Would appreciate knowing how your problem turned out and what had to be done. I have a Jenn Air Model JSD2695KES. Cannot change the display from Crush Ice to any other option. Display is stuck on Crush. How to I reset display to be able to select other options other than Crush? Can you please tell me what this could mean as it is defrosting. If cooling is off, all dashes (—) will appear on the temperature display for both compartments. Press either “-” button (for the refrigerator or freezer) to turn cooling on. The temperature displays will now show the temperature set points for each compartment. To turn cooling off, press either “+” button repeatedly until all dashes (—) appear on the temperature display. Your refrigerator and freezer will not cool. NOTE:Turning cooling off does not disconnect power to the refrigerator. The interior lights will turn off if either compartment door is open for more than 10 minutes. Simply close and open the door to turn on the interior lights. We have a Jenn-Air refrigerator model #JFI2589AES purchased 12/08. The ice maker door cycles continuously. When the panel is pushed all lights flash but can not change anything. And now the refrigerator and freezer does not cool anymore? We have unplugged for 10 minutes and then plugged in again and it does the same thing? Maytag model number mfi2569yem0, all lights on the display board light up when you push any button then goes back dark, the lights inside work, the ice chute opens when you power the unit back up, i have unplugged for 10 minutes and plugged back in, it is not running, fridge and freezer are hot. I have a GE hotpoint refrigerator. After a power outage my temperature control display is blank. Also the compressor and fan are not working the model number is HSM25GFTSA. Try unplugging the GE Hotpoint refrigerator for 5 minutes to see if it will bring power back to the display. Is the refrigerator attempting to run the compressor? Do you hear any clicking noises? Do the lights in the refrigerator come ON? Try pressing the TOP 2 BUTTONS on the fridge display for 15 seconds to see if that gets it out of the DEMO MODE or POWER OUTAGE MODE. Lights up when door is opened or when using ice or water dispenser but controls not working. Fridge and freezer working fine. Electrolux refrigerator ice maker thermistor was damaged. Had a party and everyone was getting ice from the tray. I had a communication error on my touch screen (s cf). I replaced the damage thermistor with ice tray kit. Still with the same error, replaced the main communication board under the refrigerator. That is the only board they had, now the screen is dead, replaced it with the old board, same issue. LG fridge/freezer model LRFD25850. Display panel does not light at all. I cannot do a reset because none of the buttons work. The fridge is too cold, freezing food. Inside lights work. We replaced the display board and back control panel but that’s not the problem. If you have replaced the display board and the main control board at the back of your LG Refrigerator, then recheck that you have the wiring harnesses secure and in the right position. Did anything get pinched, bent, damaged when replacing the boards? Why did you replace both boards on the fridge in the first place? What was the issue then? We are having the same issue with the LG LRFD25850ST and we cant find a replacment part for the dispenser display control panel (states discountined on all websites Ive checked) Do you know how many times to press a button to try and adjust the fridge correctly again.. Display is blank – do you think the buttons would still work and maybe the display lights would be out??? Could unplugging it help reset it??? HELP I have a baby and a child in the house… everything is freezing in the fridge.. frozen milk, strawberries lettuce… HELP please!!! We have a Hotpoint side by side refrigerator that stopped working yesterday. The light in the fridge/freezer are both on but it is not cooling and the display in the freezer door is dark I can’t see any LEDs indicating cold level and ice maker. Either way have you tried the simplest way to reset the fridge by unplugging it for 10 minutes? How old is the Hotpoint refrigerator and what is the model number? We have a Whirlpool refrigerator model#gd5nvaxwa00. The display in the thermostat panel doesn’t work after a power outage. We unplugged it for 5 min or so and the lights came back on. After a short time it went out again and the compressor doesn’t come on after the lights go out. We had a power outage Yesterday and the display on our refrigerator is not turning on. The internal lights are the only thing working, the screen/display panel is not. I have a GE Model GLM23QETA GS, hope You can help me , I might loose all of the food. There are 2 very common issues that can stop everything from running on your refrigerator and only leaving the lights on. You will need to check these boards and the wire harnesses that go to them. In this case the usual suspect to cause your issue is replacing the Defrost Control Board. Make sure to troubleshoot the issue to be sure which board or harness may be causing the problem. I noticed my fridge had stopped working. The meats in the freezer were starting to defrost and the refrigerator part was warm. I checked the power outlet and power is coming from it. The light in the fridge part is working. The control panel is completely dead, no lights, no display. The compressor and the fans are also not working either. We did not have a power outage last night. I have tried holding down a combination of buttons on the control panel to see if it needed to restart. Can someone please advise me what to do next. I have been looking through troubleshooting websites but I don’t understand them and can’t find anything relevant to my situation. The lights work in your Maytag refrigerator…. but it is not cooling, the front display is not illuminated and the compressor and fans are not running at all? Have you tried to simply unplug the fridge and plug back in after 5 minutes? You probably have a faulty main board. It is called the REFRIGERATOR ELECTRONIC MAIN BOARD. If you have tried everything, this board is probably the culprit. You can find it online at appliance parts companies for around $120 to $200 US dollars. We had a 15 hour power outage yesterday. My Samsung Model # RF28HMEDBSR-AA was plugged in the whole time & when the power came back we had a blank display. We tried unplugging for various times & pushed various buttons on panel but still not working. No cool or freeze. I have a Maytag Refrigerator that quit working after lightning hit a transformer. Model mfd2562vem11. Control board is dark until you hit any button. When button is pushed all characters and leds light up. Replaced control board. Same result. No Tech sheet with refrigerator. Freezer and fridge not on. Besides the Control board being dark…. Does the compressor run at all? Here is the owners manual for your Maytag Refrigerator MFD2562VEM11. The power outage may have damaged a relay or cap in the back bottom of the refrigerator. Check the parts with a meter to be sure the parts were not overloaded during the power surge or power outage. Here is a parts list for the Maytag MFD2562VEM11 that will show you the parts that may need to be checked or replaced. Hello my display panel is frozen it but both the fridge and freezer work fine, is there a way i can reset it? Previous post: GE Dishwasher Error Codes – Electronic Models – How To Diagnose Fault Codes?